How to Find Your Spirit Animal – The Complete Guide, is intended only for those who are truly ready to take the journey. It’s a powerful path to walk and shouldn’t be taken lightly. There are many different ways to find your spirit animal. My complete guide offers tons in-depth information on this process. As I learn more, I’ll share more so bookmark WhatIsMySpiritAnimal.com and keep checking back for updates! Are you ready to meet your guide? Finding your spirit animal can radically change your life in countless, positive ways. Working with your animal spirit guide’s ‘energy’ or ‘medicine’ can help enhance your mental, physical, emotional, and spiritual abilities. When you find your spirit animal you’ll have a choice to make – either accept its messages and act on them or walk away. Should you accept your animal spirit guide’s messages and act on them you might find your whole life transforming. Because finding your spirit animal and truly integrating its energy, medicine, and lessons into your existence is a spiritual awakening. Relationships, careers, thought patterns, tastes (food, drink, clothing, music, and more) – anything which no longer serves your highest and best interest will fall away. When you find your spirit animal, you begin to understand there are worlds beyond the material one in which we live. Your 6 senses can become sharper as you start using natural instincts to “think”. This can seem a little overwhelming but if you weren’t ready for transmutation, if you weren’t ready to live a better life, you wouldn’t be searching for your spirit animal and you wouldn’t be reading this article. Courage to leave a toxic relationship, ask for a raise, go to college. Ability to communicate more effectively or speak your truth. Path to tune into your psychic or intuitive self. Strength to kick depression or addiction and find your joy. Wisdom to make tough decisions. Fearful– It can be much easier to find courage if we come to know the Tiger spirit animal and trust that it has joined our posse. Sad – The playful Otter spirit animal can have us giggling in no time! Angry – Peaceful Panda spirit animal can help talk us down off the proverbial ledge. First, and most importantly, your spirit animal is not separate from you. Its energy and spirit is now and has always been part of you – of your basic nature. After all, humans are animals. So, in some ways, you are your own spirit animal. Wait a minute. Spirit animals are entities that are supposed to mysteriously show up and deliver messages when we need them, right? Oh, if that were only true. If only outside forces would show up throughout our lifetime and save the day! We could just sit back and enjoy the ride. But, in the many years I’ve been researching spirit animal guides, energy, and medicine, I’ve come to know it doesn’t work like that. Though we have animal spirit guides who do appear in our hour of need, it’s our own soul who cries out to the animal kingdom for help. Animal spirits hear those pleas and rally around us to offer protection, hope, healing, and wisdom. Technically speaking, our spirit animal chooses us. However, because we subconsciously ‘ask for help’ we are why they show up. How Does My Spirit Animal Find Me? Science gives us evidence that DNA matches can be found between humans and many other animals – even plants. This means living things are infinitely intertwined. The Native Americans call this relation ‘Wakan’ and ‘Wakan Tanka’. To the Native Americans, everything has its own spirit (Wakan) but all share the same spiritual essence (Wakan Tanka). This is why Native Americans refer to animals as ‘peoples’. Because of this intricate connection, when your soul sends out an S.O.S. all other living things hear the signal. The name for this is the Non-Local Universal Mind. At Shift.is, you can check out the awesome (and extensive) article about the non-local mind. So, when you need help or guidance all animals hear your heart and the appropriate creatures appear. When one is called to connect with their spirit animal it’s a sign they’re ready to evolve into their ‘true or authentic self’. What does our “true or authentic self” have to do with spirit animals? Earlier, I pointed out that your spirit animal is a living part of you because all animals are related. Just like a child will have the same traits as its mom and dad (red hair, brown eyes, or like/dislike broccoli, etc.) we are, literally, related to all other living things. What this really boils down to is that part of you is a tiger, a snake, an eagle, a cricket, etc. Even if only in a minute sense, you have cellular memory of what if feels like to be any and all animals. When you are called to find your spirit animal, you’re really searching for the part of your own animal spirit which has been fragmented, injured, or lost. This is why some Shaman specialize in a thing called “soul retrieval”. The idea of ‘soul retrieval’ is that as our spirit suffers trauma, little parts of it break off and are left along the soul’s path through each lifetime in which it incarnated. Your true or authentic self is not angry, depressed, or weak. The real you is whole, strong, and happy! A true Shaman (of which there are very few) will enter an altered state of consciousness and travel back down your path, gathering those broken parts of you to ‘bring back’ – helping you to return to strength and wholeness. By finding your spirit animal, you can act as your own Shaman and rekindle your personal power. Now, on to how to find your spirit animal! There are any number of ways to find your spirit animal. Pay attention to what animal or animals keep showing up in songs, pictures, movies, books, conversations, etc. Trust that if Red Cardinals, Horses, Crickets, etc, keep appearing to you, they are trying to help you in some way. Meditation & journeying involves attaining an altered state of consciousness and the use of deep imagery or visualization with the specific intention of meeting your spirit animal guide(s). These methods can be guided (spoken, drumming, music with vocals) or it can be non-guided (silence, nature sounds, instrumental-only music). Below in the meditation directions you’ll find one of my favorite instrumental meditation tracks. Dreams about animals. Humans often do not believe they are receiving messages from their spirit animal guides so they will come to us in the dreamstate. Often, it is much easier for folks to trust their dreams rather than their own intuition during waking times or meditations. If you are committed to finding your true spirit animal, mediation may provide some surprises. Try your best to be open and trust that the “right” animal spirit guide(s) will present themselves to you. Do not be afraid if a sick or injured animal appears to you. Remember, your spirit animal is the guide who shows up when you need him/her most. Perhaps you are feeling lonely and don’t know how to make or keep friends. An injured Dolphin may appear to you. Dolphins are social creatures who represent community. Dolphins are well known for befriending many different species – often times saving their lives. In this case, maybe the Dolphin appears to let you know that to have good friends, you must first be a good friend. Maybe Dolphin has come to remind you that laughter is healing and it’s time to lighten up. One spirit animal meditation technique is to focus on one chakra at a time and take note of the animal(s) which show up for each chakra. This method is a bit advanced so I have a complete guide coming out soon. 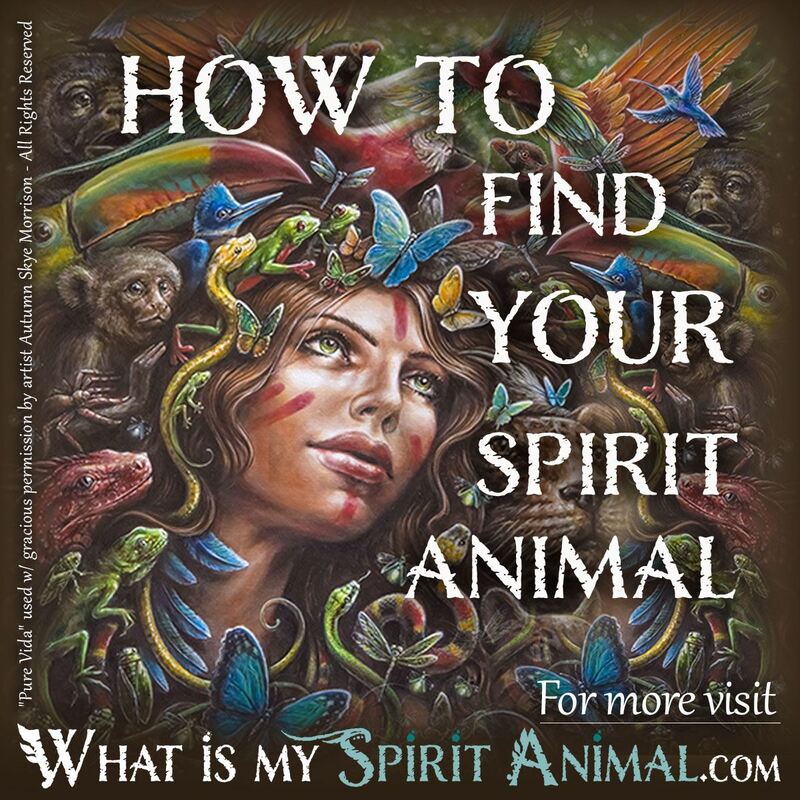 If you find yourself confused about why a particular animal came to you, look up it in my Spirit Animal Meanings database. Turn off all electronic devices and make sure you can’t be disturbed. Sit or lie in a position which keeps your back straight. This helps the energy or Chi flow uninterrupted. If you are using sound, turn on the water fountain, nature sounds CD, music, etc. Many thanks to YogaYak for creating such amazing music for the world to enjoy. Relax and breathe. Allow your body to release all tension, beginning right above the top of your head – then slowly moving down until all negativity and stress flow out through your feet and into Mother Earth. When you feel ready, invite your spirit animal to come forward. Don’t panic if an animal doesn’t immediately appear. Trust is needed at this time. When an animal appears, welcome it and thank it for coming. Ask the animal if it is your animal spirit guide. If it replies with a yes, ask what messages it has for you. Let your animal helper know you want honest messages – even if they are a little hard to know. When your spirit animal is finished delivering its messages, ask if there is anything you can do for it in return. You’ll sense when the session is nearing its conclusion. Thank your spirit animal for showing up and tell him/her, honestly, if you will integrate its messages into your life. As you are comfortable, return to the physical world. Thank the 4 directions, Mother Earth, and Father Sky and release their energies. Take time to journal the experience. Include all details that you can remember. This is a vital step. It’s not enough to meet your spirit animal and, then, forget him/her/them. It’s helpful to revisit your guide’s lessons until you no longer need its medicine. It’s important to create a protected sacred space before you start the spirit animal meditation. Remember, when you meditate you are in an altered state and you want only peaceful and loving spirits to contact you. One of the best ways to create a protective field of energy around yourself is to call in the 4 cardinal directions: north, south, east, and west. Below is an example of a prayer/affirmation/spell (they are all the same thing) you can use to call in the four directions as well as Mother Earth and Father Sky. When the meditation is over, thank the four directions/Mother Earth/Father Sky and bid them farewell. Spirit of the East, direction of new beginnings and home of the winds. I bless you and ask for your wisdom and blessing here with me today. Please join and protect me, Spirit of the East. Spirit of the South, direction of passion, creation, and inspiration and home of the fire. I bless you and ask for your wisdom and blessing here with me today. Please join and protect me, Spirit of the South. Spirit of the West, direction of the harvest and home of water. I bless you and ask for your wisdom and blessing here with me today. Please join and protect me, Spirit of the West. Spirit of the North, direction of stillness and introspection and home of the deep earth. I bless you and ask for your wisdom and blessing here with me today. Please join and protect me, Spirit of the North. Spirit of Mother Earth, thank you for holding us all in your fertile womb. I am grateful for the life you provide to all. I bless you and ask for your wisdom and blessing here with me today. Please join and protect me, Spirit of Mother Earth. Spirit of Father Sky, thank you for shining your daylight so that all living things can thrive. Thank you for the glowing moon and stars. These light our way so we can always be reminded of angelic realms, even in times of darkness. I bless you and ask for your wisdom and blessing here with me today. Please join and protect me, Father Sky. Once you find your spirit animal, learning to integrate its teachings into your world can be exciting and sometimes a little confusing or scary. Understanding Biomimicry can help. That’s a fancy way of saying that we should look to nature and mimic its systems because doing so will help us live a happier and more sustainable life. Are you a police person, fire fighter, or in the military? Do you need to move stealthily through a potentially harmful situation? Learning to mimic the cautious, then decisive, and lightening fast movements of a Cheetah might help. Are you on a sports team and need to learn how to aim more accurately? Learning about the incredible eyesight of a Hawk may help. Do you work at a child care center and need help learning how to corral all the kids in after recess? Maybe taking a look at how herds of horses move as a single unit can help. Though the video below focuses on plants (they can be spirit guides, too! ), take a minute and watch it so you can better understand how finding your spirit animal does little good unless you put its spiritual messages to use. Learning all you can about your spirit animal guide’s habitat and behavior can really make the difference in being able to learn and grow from the guidance it gives you. As you learn more about your animal spirit guide, lessons you hadn’t originally known or realized will present themselves. Leave a comment below and let me know what you think or how else I can help! Also, feel free to contact me! Sacred artwork for the the featured image was graciously supplied by visionary artist Autumn Skye-Morrison. Okay, so when I was younger(I’m still young now but when I was younger-8 maybe? )I had an animal that I loved a lot! But for some reason it has slipped away from me and I haven’t really had time to really focus on the animal but now I’m thinking on it and I really miss the connection…could this animal be my spirit? Any thoughts on what to do? Thanks! I Havd Tried the Meditation twice with the prayer given. Did I do it wrong? Did my spirit animal not want to come to me? Am grateful with all that am able to learn from this article and many other from the website. Truly grateful. Thank you! I believe I met my spirit animal in a dream last night. I also believe that is how I was lead to learning about him and to this website. In my dream the land had turned into an ocean that was being pushed by a storm toward my house. In the ocean I saw dolphins and whales diving in and out of the water. As the storm and ocean were getting closer, I looked down and saw a dark green alligator standing next to me on land. He wasnt a big alligator, and I wasnt really afraid of him. We just watched the storm moving the ocean, dolphins and whales toward us. The dream was different, so I thought the animals had some sort of significance and looked up dream interpretations, which lead me to spirit animals which lead me to this site. I really believe that alligator is my spirit animal now. Is it possible to have more than one spirit animal at different points in your life? Is this possible that the spirit animal of mine be a common animal like a dog? Actually I had a dog whom I loved so much, but years ago it passed. I remember him many times and occasionally get the old memories and think of the times we spent together. Can this happen that he be my Spirit Animal? There is a monkey that always shows up in my balcony. He sits alone just like i m feeling alone and vulnerable in my greatest hour of need. He just stares at me and today i felt like i have some connections with him and i cried as i saw him alone . Is it possible that monkey is my spirit animal?